Australia’s Debbie Crothers starts the week with some Funny Things. Together her series of wrapped natural items becomes a mixed media wall installation. Debbie’s been experimenting with faux ceramic effects, wrapping white polymer around natural coral and palm fronds. Forged artistic wire and rounded cane slices accentuate some of the pieces. Flip through Debbie’s pages of work to see how she’s progressed, improving her skills, circling back and bringing funny things to a whole new level. Anna Winter sent the link and encouraged me to look at Debbie again. 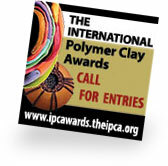 Beginning October 1, you may submit photos of your art into the IPCA’s Polymer Clay Awards, the world’s largest juried contemporary polymer art competition. The awards will be presented at the 2014 EuroSynergy in Malta in May. Full disclosure: I’m one of the three judges and we want to dig up the best art possible. We’ll be hounding you from now until the submission deadline in January so you might as well get used to clicking on this call for entry icon. I love how free these are, no boundaries. I agree with Wendy, they’d make a great grouping. Inspirational Debbie! Your new wrapped relics look wonderfully playful. I love the looseness of the wraps and your eclectic collection of wrapped goods. The palm flower stems look great in the wraps. Debbie is such a love, so creative, and just the sort of artist you yearn to hang out with—a clay day with her must be a blast! I Love this new series–exactly the thing to jump start my day. yay!!!! all the way from Down Under. How cool to be featured here – thanks so much Cynthia and huge thanks Anna. Glad you guys like my funny things…..woohooo!! Love love love watching the work of this talented artist and teacher evolve over the years. Debbie, let us know when you have photos of the wall installation…I imagine it will come together beautifully. Way to go girl!